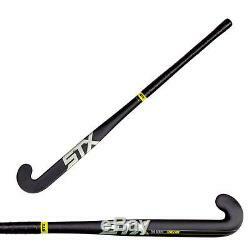 STX Stallion 700 Series Composite Field Hockey Stick. Provide support in the top field while supporting the defense in back with the versatile STX® Stallion 700. Designed for elite midis, this Carbon-Aramid composite field hockey stick has an Optimal Balance Point and Rounded Handle for greater comfort, and a light stick feel without compromised power. A thinner toe design allows more control, while the Karakal grip promises exceptional performance in any playing condition. FEATURES: Elite field hockey player's stick Bow: Mega, 24 mmToe: Maxi Materials: 95% Carbon / 5% Aramid Weight: Light Provides power and control for the midi who desires versatility and speed from their gear Rounded handle for greater comfort Optimal Balance Point delivers a lighter stick feel without sacrificing power Thinner toe design allows more control Karakal grip technology offers a durable, tacky texture that performs in any playing condition. Available Weights: Light / Super Light. 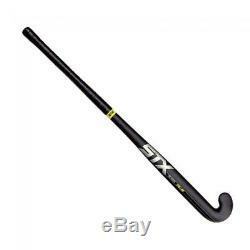 The item "STX Stallion 700 Series Composite Field Hockey Stick Size 37.5'" is in sale since Wednesday, October 19, 2016.